Trends and Markets in Aquaculture Feed Ingredients, Nutrition, Formulation and Optimized Feed Production and Quality Managemen Dubai, U.A.E. Food Texture Technology: Hydrocolloids, Emulsions and Proteins Chicago IL, U.S.A.
Algae for Value Added Applications - 15 Years Down the Road: What Have We Achieved? What Technology Can Make It Work? Lisbon, Portugal. 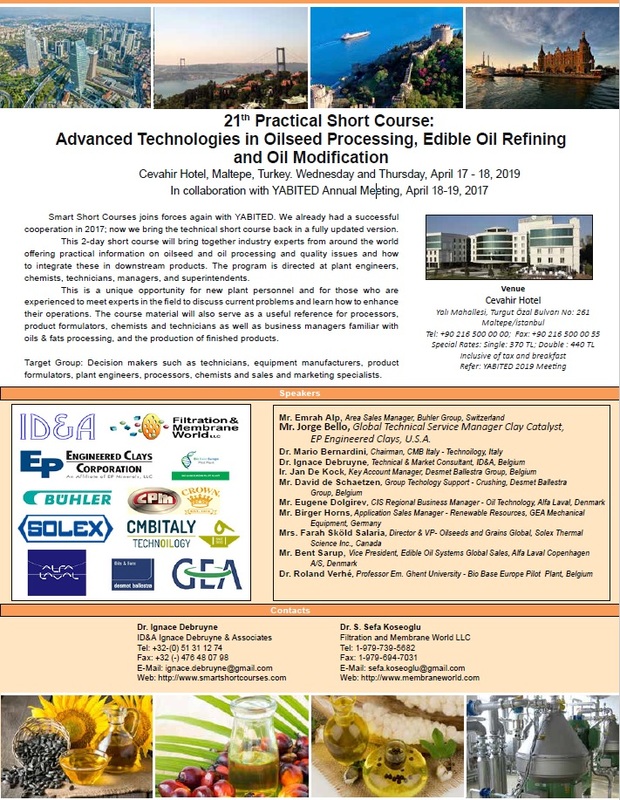 Best Practices in Oilseeds, Oils & Fats Processing and Applications Dubai, U.A.E. 4th Practical Short Course: Algae Harvesting and Downstream Processing for Value Added Applications Phoenix AZ, U.S.A.
Pre- & Probiotics – Market, Science, Regulations and Applications New York, U.S.A.
2nd Practical Short Course: Algae Harvesting and Downstream Processing for Value Added Applications San Diego CA, U.S.A.
Functional Food Product Development: Market, Regulations, Bioactive Compounds and their Utilization Las Vegas NV, U.S.A.
Advanced Oilseed, Oil Processing and Formulation Technology Munich, Germany. Omega-3 Fatty Acids: Market Trends, Nutrition & Health, Utilization in Food Systems Newport Beach CA, U.S.A.
Advanced Oil Processing - Palm, Palm Kernel and Coconut Oil Processing and Food Applications Newport Beach, U.S.A.
Omega-3 Fatty Acids: Market Trends, Nutrition & Health, Utilization in Food Systems Chicago IL, U.S.A.
Aquafeed USA - Aquafeed Platform Aquaculture Feed Extrusion, Nutrition, & Feed Management Miami, FL, U.S.A.